I wanted to take a quick break from the wintersday speculation (while there's still time - before more tidbits drop and markets start fluctuating even more) to talk about short and long term investment in Guild Wars 2. What we've been talking about the past few weeks in relation to wintersday (like here, here and here) is short term speculation. An event is coming up and that event and the speculation before it are temporarily going to drive prices up. Short term investments are, if you like, good methods for getting building your fortune in short starts and jumps. You are in and out relatively quickly. Long term investments are ways of keeping currency safe (from inflation - where the quantity of currency in the market means the currency is actually worth less as time goes on) and, ideally, to make that value that you stow away worth more in the long run. Now ideally you want to divide your funds between short and long term investments (with an amount of liquid, or free, gold in case you need anything or spot an investment opportunity that needs quick action). You gain from short term and you reinvest these gains into more short term investments along with long term investments. Investment diary day 1 - put 2 gold worth of buy orders in for chocolate after it fell sharply from 60 copper to 35 copper - the slump after the first big spike of last week. Investment diary day 2 - listed the chocolate won for just over double 75 per bar. Investment diary day 3 - collected approximately 4 gold. Chocolate DID have a second spike (in fact it had another major spike to nearly 1 silver 50 copper). Investment diary day 4 - moved onto other short term investments for 2 gold. Placed 2 gold into a long term investment (gems). Now the money came out of the short term investment towards the end of 28th November - at least that's when our man (or woman) invested in gems. He did this for a number of reasons. 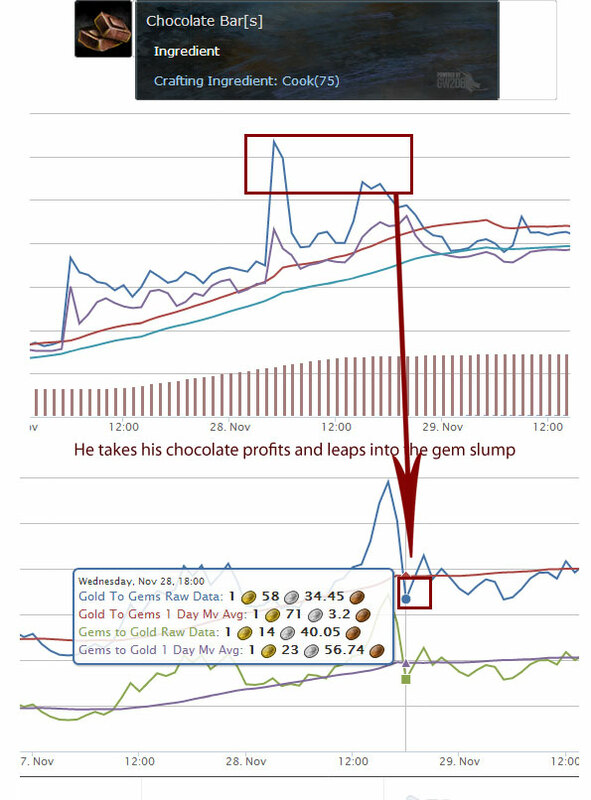 Firstly the gems had just spiked to as high as 2 gold 20 and fallen after that (each spike is followed by a slump) so it was a good rate. Secondly, gems are one of the best long term investments in GW2. The only other long term investments we've really talked about so far are halloween items and chocolate and butter just when the nerf to their drop rates were announced (look how that combined with the short term investments this week past). Why invest long term? I mean, you can see that short term investments can be very profitable. They can. But they're risky. They're also time intensive. For instance, I've had a very busy week and haven't been able to look into much short term (day or week) trading. So I've taken a lot of my funds and placed them about 50/50 in gems and glacial lonestones (lodestones) and glacial cores. The cores and lodestones may not pay off. They're a short term gamble (for wintersday) but in truth I believe they'll increase in price anyway. It's not a market I'd need to check every couple of hours like a few other wintersday hopefuls. Even if they don't gems will pay off long term. Get over to gw2spidy and select gem exchange at the top then hit all. See that climb? You have to pay a fee for gems and it's a bit harsh but you won't suffer from the deflating price of inflating gold. Truly, the crux of my post today is to remind you (if you've forgotten) to mix long and short term investments up (especially if you've not got the time to trade all day every day :P) and to remind you that gems are a pretty good long term investment vehicle. Okay, now to the best part - encouraging comments: what other potential long term investments are you guys hiding gold in? What other trading strategies are you enjoying this weather? Problem for me is I want gems to spend -_- bank/bag expansions and such. If i buy gems I will likely spend them haha. if u want to invest in gems i would w8 until there is a special offer for buying gems with real money. Well, see I've bought gems before (for expanding bank space, character slots and the like) and I don't fancy buying them to convert to gold when I want gold. I prefer the economy within the game. But what you're talking about impacts those of us who won't spend money on gems too. When a lot of users buy gems on offer, many of them are going to want to get gold. This means more gems will be available and the exchange will show a dip in the amount of gold you can get for gems. Depending on the offer, quite a large dip. This is a perfect time to invest in gems long term - when their gold cost is cheap. When the offer is gone and users have their gold the gems in the economy are used up. There are fewer. A month down the line - maybe a sale on items you get with gems - cash your gems out. One thing that I am investing in long term is thick leather sections. With the price to buy them on the trading post being 1 copper over vendor price, its a cheap long term investment. For every 10,000 leather sections I buy, I only put 1 gold at risk. I feel that they are a good target for Anet, because they are heavily oversupplied, and stagnant on the market right now. If toy maker Tixx uses thick leather sections for his toy creations then its a market that will see some movement hopefully. Even if they aren't used for Wintersday we have seen Anet step in to correct over supply before. thick leather is the onliest material that is only 1c above the vendor price or? thinking of investing in them too (about 50g) what do u think? I was the one the original Anonymous that posted about the thick leather sections. I agree with the poster above, that it is a long term investment, and not something that you should do with capital that you need for current or close range investments. But if 50 gold is money that you can store away safely knowing that you wont need it anytime soon, its not a bad investment to make. Eventually I think that people will realize that selling them for 8 copper actually cost you money vs selling to the vendor, and the price of them will rise to 9 copper naturally on its own. One thing I'm confused about is how do you get into gem investing when the rate is clearly on the rise? I just started trying to become more market-aware about 4-5 weeks ago. I started with about a gold and have just hit the 10 gold mark this week. When I hit the 2-gold mark, I starting investing some of my take everyday into gems after I saw all of the cool stuff for the Halloween sale. I knew I wanted a way to buy that without getting kicked out of the house for spending money gems. I bought about a total of 200 gems at about 80 silver / 100 gems. I stopped buying when the cost of gems started to rise above my daily take. I was putting most of what I earned each day back into the market trying to make more gold. Now, I WANT to get back into gems, but am not sure what to do. If I sell my 200 now, or better yet, towards the end of the week, I'll probably make about a 1.5 - 2 gold profit on those gems. The question I have is how do you get back into buying gems? Do you set an amount - say X gems and just buy them everyday regardless of cost because you believe that the market will average out? Or do you sit on your cash and wait for gem prices to drop? At this rate, I don't know if we'll ever see a sub 1g / 100 gem rate again! How do you invest in gems when your starting funds are so limited? What is the purpose of investing in gems - to sell later when the rate is high?